more lollipops, reassuring hugs and kisses. He slept off in my room that night and I didn't bother taking him back to his, I wanted to make him as comfortable as I could. Can't blame a mummy. The next day, he could not go to school so he wouldn't spread it to his classmates. He was glad to say goodbye to his siblings because he knew he had a lot to gain. Guess what, that same day, I got home with itchy eyes and my older kids pointed to me that I had a red eye. Hmmmm, so I caught it too! I thought as I went for another bottle from the pharmacy. By the time we woke up on Thursday morning, all four of us had red eyes while our patient zero's red clogs had started giving way to white snowballs. All three kids stayed off school on Thursday, but by Friday, Patient zero went back and the others stayed home. On Saturday, my case had spread to both eyes which had become extremely red, discharging fluid per second. I kept wiping with warm saline, as advised. I became the baby, wondering why mine got really serious. Another chat with the doctor made it clear that attempts to apply the eye drop myself, making the tip touch my eyelids and lashes constantly had contributed to the extremity. Being the only adult at home, I had to correct this by trusting God to help my kids drop the ophthalmic solution in my eyes properly, after proper tutelage though. On Sunday morning, I asked myself - "what have I learnt from this?" 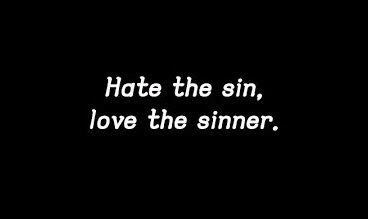 and a line dropped in my head - Hate the sin, not the sinner. Just like I tried to reassure my baby by holding him a million times more than I normally would, I should have cleaned and sanitized my hands a million more times too; so I wouldn't become a victim of what he was going through. Until you learn to hate sin appropriately, you are not qualified to love the sinner; or you will either become worse than your patient zero or end up mocking his situation instead of helping him through. A couple of years ago, I heard of a boy who went visiting his cousins. He was shocked at the state of immorality he met them in, they were young but wild. Initially he tried to change them, but ended up joining them and becoming worse. What happened? He was trying to change them in his strength. There's nothing wrong in trying to help someone get better, but there is a lot wrong in trying to use your head, your wit or great words only. 2Cor.10:4 (For the weapons of our warfare are not carnal, but mighty through God to the pulling down of strong holds;)KJV. Have you prayed for that person you hope should change? Have you asked the Holy Spirit for direction? The work is really not yours, you know. It is God's, because a Christian is a soldier in the army of God, an army which has its rules of engagement. So people, hate the sin and not the sinner; but make sure you are not struggling to get a speck out of someone's eye when you have a big log in yours.